Maria by Callas: What does Diva really mean? I write to the luscious tones of Maria Callas. Tom Volf, the director of the new documentary Maria by Callas fell in love with her voice only five years ago. He had a coup de foudre for all things Maria and it took him the better part of four years to pull off what is really a marvellous documentary. 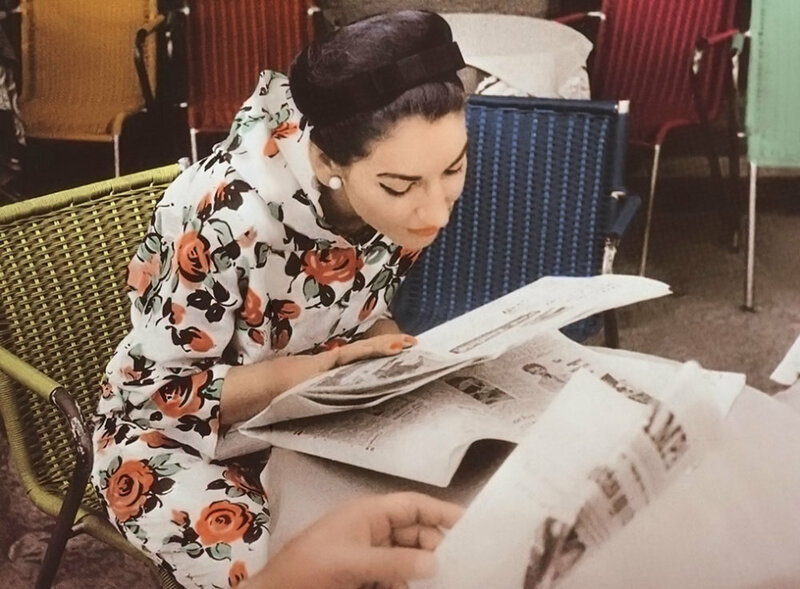 Instead of talking heads, and a narration, la Callas, as she referred to her professional self, or Maria as she referred to her personal self, is captured in on-and-off the record interviews with Joyce di Donato standing in for her when she is momentarily absent. Entire songs rather than excerpts let you bathe in the voice, the mannerisms (I want the shawl, I want to hold my arms in a self-embrace, I want the bouffant hair). Of course it’s the early years that fascinate. Born in New York City, she becomes a more elegant and refined citizen of no country with the haute accent that goes along with that. The pudgy prodigy, nudged by her mother to Greece for training with a Spanish diva who is discovered early on becomes the leading bel canto singer of her generation. The images of her looking up at the camera, the cat eyes, the wide mouth, they are indelible. Besides her voice, she knew what her assets were. The dramatic career buttressed by the long affair with Aristotle Onassis, interrupted by an equally ambitious Jacqueline Kennedy, and then a rapprochement when La JO had had enough is grand opera in itself. Don’t ever let great artists con you by saying their lives are separate from their work. If you don’t know Callas, Amazon Prime has a lot of free Callas, and there is You Tube. But the film is special, the house was packed Saturday night in NY at the Paris Theater, I could only think with Met opera goers who were not at the opera itself (Callas warred with the Met much of her career). The film is a brilliant look at what goes into being a celebrity of any decade. We talk about divas. There are divas and then there are Divas. Callas was the latter. I took a break from Manifesta when through the graces of a good friend I was able to spend a few hours with Gioacchio Lanza Tomasi, one of the models for Tancredi, the soldier who is ‘adopted’ by Don Fabrizio, the Prince in Giuseppe di Lampedusa’s Il Gattopardo. A recent Film Society tribute to Visconti shows the enduring admiration of the film version of the novel—it was their most well attended retrospective ever. Tomasi, himself from an aristocratic family, inherited the last remaining palazzo of Lampedusa’s. Though it now houses the cooking school of his wife Nicoletta, and a B and B, its major floors and reception areas have been lovingly maintained and replenished. I felt as if I had entered into the film as I follow Tomasi down its grand balustrade, trod its polished marble and parquet flooring, looked up at its elegant chandeliers,and out its grand windows overlooking the Mediterranean,and gazed upon its many leather bound books in the library, and family paintings and drawings by artists as well as manuscripts of the novel in vitrines. Tomasi has had a distinguished career as a musicologist, opera administrator, professor and writer. His Biography Through Images of Lampedusa is a trove of unpublished photographs of Lampedusa’s very interesting lineage and marriage, as well as a few gems of Tomasi in intense conversation with Visconti as the film was in production. Over tomato crostini and prosecco, we chatted about the film, the novel, life in Palermo as well as his views on Manifesta. I think however that my tour of the palazzo guided by Tomasi says more than any words could. I recommend also a reading of The Leopard and of Tomasi’s biography as they are very good records of the Sicily which once was, and still exists in pockets in Palermo and cities like Ragusa, Noto and Scicli.